Mercury is a dangerous pollutant that is released into our air mostly from the burning of coal in power plants. Yet the Mercury and Air Toxics Standards have been in place and working for the last several years. So well that even the power sector doesn’t want changes to them. The standards have saved thousands of lives and prevented thousands of heart attacks and asthma attacks. So they’re probably something we should keep around. Send a message to Administrator Wheeler to demand he abandon all proposed changes to the Mercury and Air Toxics Standards. As a young American, I am writing to urge you to speak out against any proposed changes by the EPA to the Mercury and Air Toxics Standards. These standards reduce exposure not only to mercury, which causes brain damage in babies, but also arsenic, lead, chromium, nickel, acid gases, and other poisonous substances in our air that have serious health impacts on our communities. According to the EPA, every year, the Mercury and Air Toxics Standards save 11,000 lives and prevent thousands of heart attacks, asthma attacks, and hospital visits. What's more, these standards are already in place and being met in the power sector. We cannot let the profit of a few polluters outweigh the benefit these protections have for our communities. 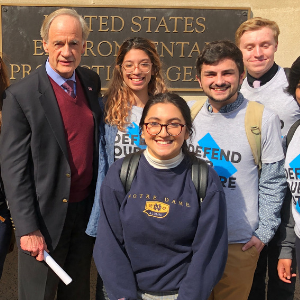 Please stand with young people fighting for the health and safety of our communities by abandoning all proposed changes to the Mercury and Air Toxics Standards.